This guide will show you the solution for RIAD 5 C drive low disk space problem on Windows Server 2003, SBS 2003. Download IM-Magic Partition Resizer Server to extend C drive on RAID 5 when it is running out of disk space on Windows 2003. 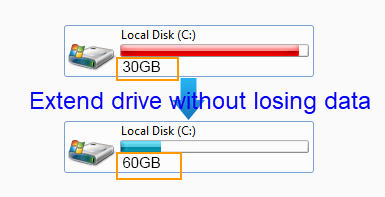 Receiving low disk space warning message on C drive on RAID 5 disk? A third-party partition software can help fix the problem easily without rebuilding RAID array. 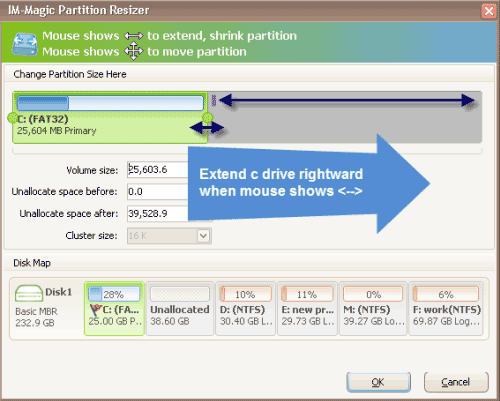 IM-Magic Partition Resizer Server allows you to reallocate space to C drive by moving free space from other partitions on the RAID 5, so you don't need to reinstall system or rebuild array when RAID 5 C drive is running on low disk space. This partition software can work with all Windows Servers including Windows 2003, 2008, 2012 and more..
Move the arrows to shrink the selected partition and then you can create some unallocated space. Extend the C drive by adding the unallocated space to it and then click "Apply" button. "I have a RAID 5 array with 4 disk drives on my Windows Server 2003 computer. Recently, the RAID 5 array is nearly full, so I added another 500GB drive to the array and it shows as unallocated space behind the array. How do I add the unallocated space to existing RAID 5 array without touching any data on the array?" "I added 3 500GB disk drives to build my RAID 5 array on my PC which run Windows 2003 operating system. Now, I want to add another disk drive to the RAID 5 array. But my array contains almost 1TB data, so I don't want to rebuild the array and lose any data. How can I add a new drive to existing array without rebuilding?" If you want to add a new disk to extend RAID 5 array, you need to reinstall system and rebuild the array. As a matter of fact, things can be much easier if you can use professional partition software, with which you can add new disk to an existing array without rebuilding. IM-Magic Partition Resizer Server allows you to add the new disk space to existing RAID 5 array without touching any data stored on the array. Before adding the new disk, you should make sure if the disk can be compatible with the RAID 5 array. If you don't want to use the partition software, you had better backup data to another device and then rebuild the array. Adding new disk is not the only solution for RAID 5 partition low disk space fixing. If there is more than one partition on RAID 5, you can easily move free space from other partition to the partition that is running out of disk space. For instance, when C drive is running on low disk space on Windows Server 2003 RAID 5, you can squeeze free space from D drive. The free space will show as unallocated space, so you can add it to the C drive. Windows 2003 built-in Disk Management doesn't have such kind of function to extend RAID array, so you need to employ partition software to add the unallocated space to resize RAID 5 C drive when it runs on low disk space. If you can rely on professional partition software to resize RAID 5 array, you don't need to reinstall system or rebuild the array, which make the partition resizing easy. IM-Magic Partition Resizer Server enables you to extend C drive on Windows Server RAID 5 so that you can fix the low disk space problem effectively. By using this software, you can resize RAID 5 C drive without moving or deleting any data. It provides safe method to resize the array. This partition software supports NTFS and FAT32 partition. You even don't need to reboot your PC in order to extend C drive space on Windows Server RAID 5.